New York City Transit (NYCT) is the largest rail and bus transit system in North America. The system consists of more than 6,000 passenger railcars, approximately 4,500 buses, 660 track miles, and 468 passenger stations. New York City's financial crisis in the 1970s and other economic factors that led to investment neglect left the NYCT infrastructure in disrepair by the early 1980s. Some lines were noted for their inefficiency and limited operational flexibility, resulting in a functionally inefficient operation that often slowed trains and reduced throughput in stations. In recognition of the need to rebuild the network, the first 5-year capital program was launched in 1982 in an effort to reverse this trend. Since that time, NYCT has made considerable strides toward bringing most assets to a state of good repair, and to make investments to enhance the NYCT system. The 63rd Street-Queens Boulevard Connection project is a case in point. In 1969, NYCT began construction of a new subway link to Manhattan to alleviate congestion on the Queens Boulevard line. The connector consisted of a tunnel under the East River and land-based tunnels on both sides of the river. Funding issues, however, prevented this route (called the 63rd Street line) from being completed as planned on the Queens side, and so it was terminated at the 21st Street station. The tunnel lived through various ill-fated incarnations, including the idea of using it as a link for a new subway express line through Queens, but these plans were abandoned during the city's fiscal problems in the 1970s. Dubbed the "tunnel to nowhere" because it terminated one stop into Queens, the partially finished line was put into service in 1989 by NYCT. Given the limited connection, it had only a small ridership in Queens and was underused. Meanwhile, nearly 200,000 people using the Queens Boulevard Line (QBL) to commute between Queens and Manhattan experienced severely overcrowded trains. 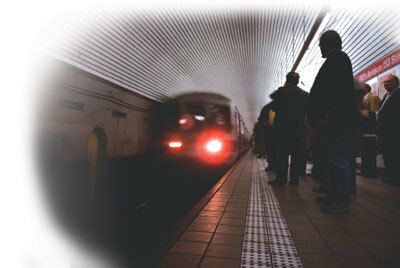 The E and F routes along the QBL operated at more than 120- percent capacity during peak hours. The 63rd Street-Queens Boulevard Connection project had a simple mission: to traverse 1,500 feet underground to connect the 63rd Street tunnel to the Queens Boulevard Line. The link involved extending the existing tunnel from just east of the 21st Street station to the QBL roughly halfway between the Queens Plaza and 36th Street stations. It was designed to increase the number of rush-hour trains into Manhattan by 50 percent, from 30 to 45, easing overcrowding on the E and F lines. Although only about onethird of a mile was needed to connect the two subway lines, the project was situated in a complex subterranean infrastructure posing New York City Transit 63rd Street-Queens Boulevard Connection-New York City significant engineering challenges. connecting the 21st Street station to the Queens Boulevard Line. The construction site was under a heavily traveled seven-lane State road (Northern Boulevard) leading to the Queensborough Bridge into Manhattan, and within a commercial area surrounded by five-story buildings. In addition, lying about 8 feet directly below the road was a five-track subway tunnel that was part of NYCT's Independent line, and directly to the east were the Sunnyside Yards, which accommodate Amtrak and Long Island Railroad train operations. Concerns about settlement of the old tunnel and adjoining buildings required implementation of measures to support the tunnel and buildings. Many utilities within the project site had to be relocated to make way for construction. Construction was started in September 1994, and completed in 2001. The 63rd Street-Queens Boulevard Connection provides a desperately needed overflow for what were the jammed E and F lines running through Queens. The F express was rerouted through the new tunnel, and the V, a brand-new train line, was added along Queens Boulevard as a local along the route the F once took. As a result of the increased number of trains running along the QBL with the connection, New York City Transit estimates that the average Queens rider on the E, F, and R lines saves approximately 31 hours per year because of the 63rd Street Connection project. Some service changes that were implemented with the opening of the new connection created dissatisfaction among some commuters who had taken the F express through its old route. However, the connection enabled a significant expansion of service capacity for NYCT, increased commuter options for customers, reduced overcrowding between Manhattan and Queens, and reduced commute time for passengers. 28U.S. Department of Transportation, Federal Transit Administration. National Transit Database, 2000. On-line at: www.fta.dot.gov/ntl/database.cfml. 29 New York City Transit. About New York City Transit: The Importance of Public Transit. On-line at: www.mta.nyc.ny.us/nyct/facts/ffintro.cfm.